I like to pretend I'm fancy, and crepes are a great way to do so. 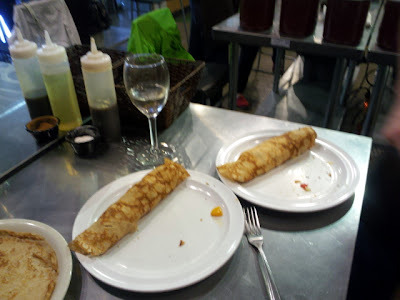 How else can you eat nutella wrapped in a pancake for lunch and call it a fancy French treat? Kelsey posted on Instagram about this class a while back and I made a mental note to snap up this deal the next time it rolled around. 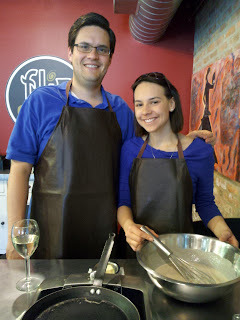 I found this deal at FliP Crepes for a BYOB crepe-making class with brunch for $35 for two on Living Social. Tim already had to be downtown for a study group, so we made a day of it. Unfortunately, we initially went to the location in the French Market and were thus late for the class at the location on Fulton (learn from my mistake!). By the time we rolled in, the class was almost done with the batter, save for the final whisking. Fine by me! We missed the boring part. 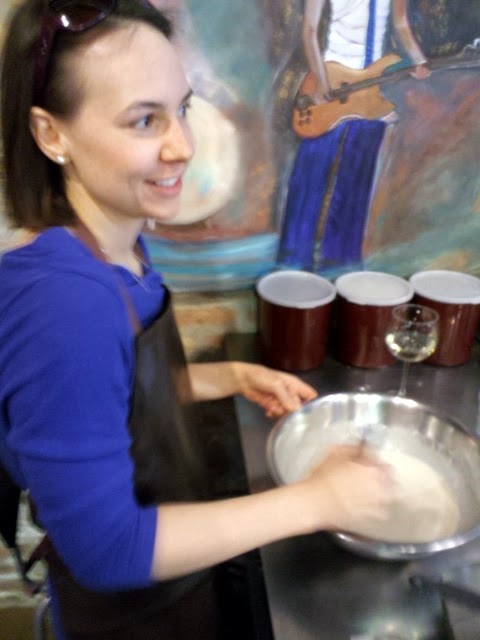 So whisk away we did, then we started assembling crepe after luscious crepe. 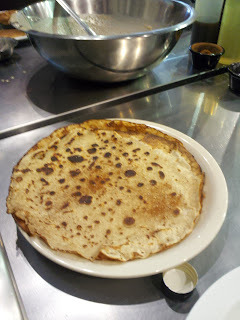 The key to a great crepe is a very hot nonstick pan, a generous slathering of butter and a watchful eye. 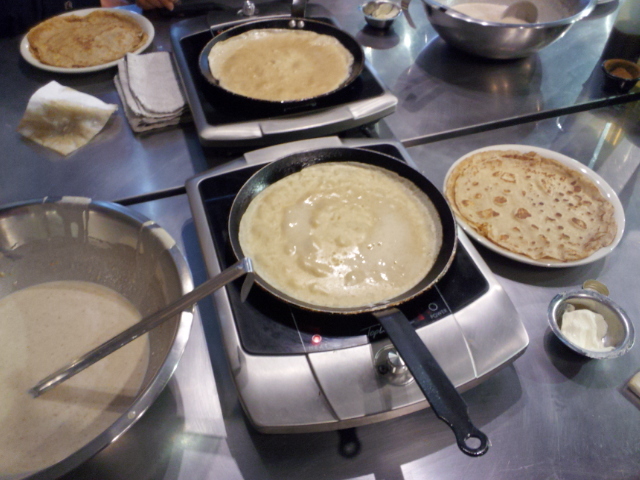 You only flip the crepe once the first side is quite set and bubbly. The second side on cooks for 30ish seconds until the whole thing is toasty brown and still tender. The company laid out coffee with all the fixings along with scrambled eggs, bacon, mixed sauteed vegetables, fruits, jams, nutella, marscapone and dolce de leche cream. So we tried some crepes filled with eggs and veggies and many, many crepes with nutella. 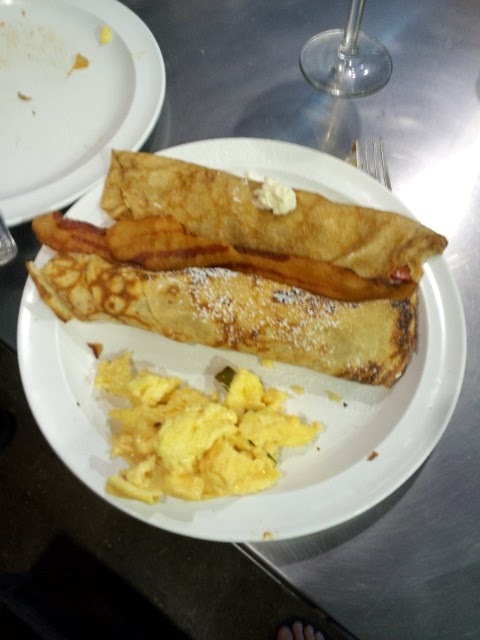 My favorite combo was probably strawberries with marscapone and cinnamon sugar. Nom. Parking was free, and we would have spent around that for lunch alone, so it was worth the $35 we paid. Plus, we have leftovers for tomorrow, too. why can't crepes be condensed willy wonka style into a bean we can eat mid run? Sounds like a fun and yummy time!